You are represented by the Panopticon Gallery, in Boston. How did you build that relationship ?? How long have you been represented by Panopticon ?? The short answer is: I got lucky. One day I got an email from Jason Landry, the owner and director of the gallery. We had never met. He contacted me because he saw several images from my Blank Billboards series in a juried show at the Danforth Museum and loved them. In addition, one of the photographs had been purchased by a collector and board member of the Photographic Resource Center, whom Jason knew and respected. Jason had also spoken with the director of the museum, Katherine French, who had good things to say about my work. Everything seemed to converge and point Jason in my direction. What is the fine-arts photography community like in Boston ?? What are the centers you find important ?? Who are the local photographers you admire most ?? There are a lot of great photographers in Boston. My favorites include Laura McPhee, Shelburne Thurber and Neal Rantoul, but really there are so many. Three local institutions stand out as especially supportive of emerging photographers: the Griffin Museum, which is a small museum of photography just outside of Boston; the Photographic Resource Center, which is affiliated with Boston University; and the Danforth Museum. They all have juried shows offering an opportunity to exhibit, and they take part in portfolio reviews. As I mentioned above, the Danforth and its director, Katherine French, have been especially important to me. How did you start working on I’m Not on Your Vacation ?? When did you begin the project ?? How will you know when it’s complete ?? My wife and I live in Boston. Six years ago, we bought a small cottage on Cape Cod. We go there most weekends year-round, plus a few full weeks here and there. For most, the Cape is a place to go for a summer vacation at the beach. The more time I spent there, the more I became fascinated with the other side of the Cape — what happens in the off season, when the population plummets and it’s quiet, lonely and raw. There are interesting characters who are drawn to “end-of-the-road” places like the outermost part of the Cape. The thousands of Jamaicans and eastern Europeans who come each summer, not for vacation but to work long hours at multiple jobs – and for a chance to see America. Tensions between man and nature, which are particularly stark on the Cape – it is, after all, just a narrow sand bar that sticks out into the Atlantic Ocean. I decided to bring these themes and narratives together into one project. As for how I’ll know when the project is complete, I’m not quite sure. I’ve been working on it for a year. I think I’ve probably got another year or so to go. I’ll probably be done when I’m no longer excited about working on the project – which is something that’s hard to imagine ever happening right now, but which seems inevitable. One final point: I didn’t grow up on the Cape and I don’t really live there. So, I’m not really the one saying, “I’m Not On Your Vacation.” It’s a somewhat obnoxious phrase on bumper stickers I’ve seen on the Cape. If anyone, it’s the subjects of my photos who are “saying” that. With its mix of portrait, landscape and still life photos, I’m Not on Your Vacation reminds me of the work of Alec Soth and Stephen Shore. Are they conscious influences ?? How do you deal with those influences without feeling overwhelmed by them ?? Alec Soth and Stephen Shore are two of my favorite photographers. So yes, they’re influences. But when I’m out looking for people, places and things to photograph, I’m not thinking about them or their work. I’m just trying to make the most interesting and compelling images that I can. How is your camera equipment important to the project ?? What do you shoot with, and why ?? I use a 4×5 camera and Kodak Portra film. I have three lenses: a Rodenstock 90 mm, a Nikon 150 mm, and a Schneider 210 mm. I love the camera and lenses because they’re extremely sharp, they give me the option of making big prints, and they give me maximum control over the plane of focus and depth of field. A view camera also forces me to think more about my pictures, because it requires more time and effort to take each picture. I can’t just fire off 20 frames. But that can also be a limitation. And, the camera can be a real pain to use when it’s cold and windy and my fingers are numb. 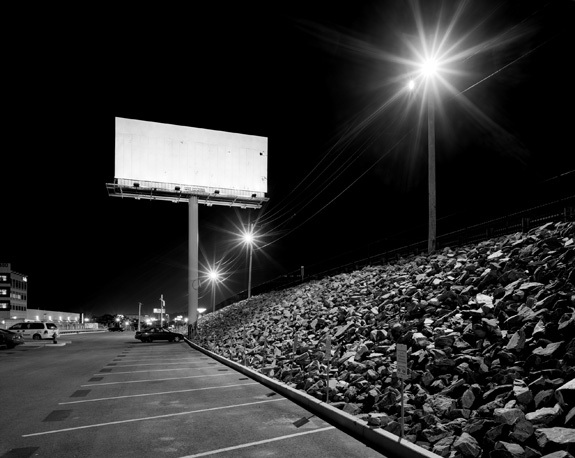 For your Blank Billboards project you decided to render the images in B&W. Why did you make that choice ?? For the first few billboard photos I took, I used color film. But I didn’t like the results. There were too many different colors in the various sources of light: red tail lights from cars that drove by, and street lamps and security lights that sometimes had a yellow cast — sometimes a blue cast. It was distracting. It stole attention from the billboards themselves. I wanted a look that was more simple and stark. So I switched to black and white film for the rest of the project. And I re-shot those first few billboards that I had taken in color.